My sweet boy learned how to ride a bike right before he turned 4 years old. I’m not sure if we should be thrilled or scared that he learned how to ride a bike at such an early age, as we worry about his safety. The biggest plus in all of it is the fact that he LOVES to wear things on his head, so getting him to wear a helmet is easy. It might be his favorite part. We have loved cheering him on. Learning to ride a bike is just one of those big milestones that are fun to check off the list. We taught him the same way we taught our daughter Avery how to ride a bike. 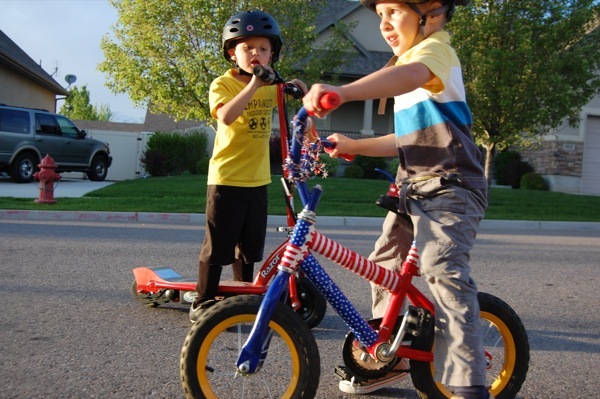 I thought it would be fun to share a few of the big tips in teaching both of our kids to ride a bike, in case this is something on your Summer To Do List. 1. Start with a small bike. The smaller the better. Your child should be able to have both feet flat on the ground. You might want to get a bigger bike to save money over time, because kids grow so fast, but this will make it harder for them to learn. 2. Don’t waste your time with training wheels. They give a false sense of security and they slow down the whole learning process. 3. Take the actual bike pedals off. Let them learn how to balance first. This is the key (I believe) to actually learning to ride a bike. They do sell bikes without pedals, but save yourself the money and just take your pedals off. Once they learn how to balance, you can put the pedals back on. 4. Have them learn on a driveway or street with a slight decline. This helps to get the wheels rolling. 5. No pressure from parents. Once you take the pedals off, let them be on their own and on their own time. 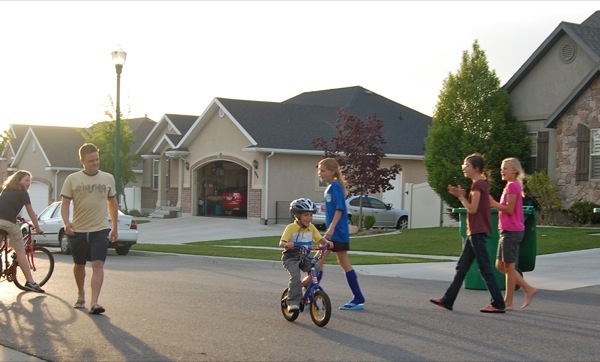 Whether it be a trip down to the mailbox or to visit the neighbors, invite them to get the bike out. No pressure is key. It’s so fun to see them so confident in their new skill. Yes, an audience is always fun once you learn how. Red, white and blue decor always helps too. Yes…this little bike is still decorated from the 4th of July neighborhood bike parade from the year before. yikes! Have you tried this method of taking the pedals off to help teach how to ride a bike? 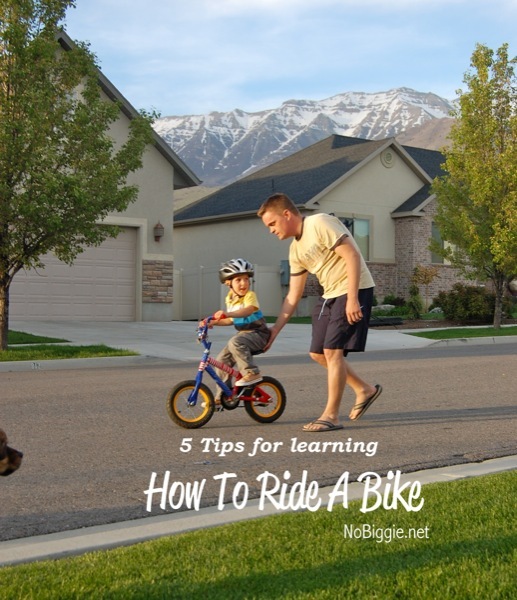 Or do you have any other little tips that you think are key in learning how to ride a bike? YES! We learned this method after you posted it about Avery and in one evening our 4 and 6 year old kids were riding where training wheels had been on the previous TWO summers with the 6 year old. We have passed it on to many friends. It is uncanny how quickly and how well it works! THANK YOU AGAIN for posting it, it’s time to take the pedals off for Graham! That is our goal this summer, getting my two older girls riding their bikes. Yay Aiden, he is such a cutie! I love that he is excited about wearing a helmet. Stella really wants to ride a “big” bike. These are great tips! We do the no training wheels but I have never taken the pedals off. Way to go Aiden!! He is so stinkin’ cute out there. He was riding his bike right next to me while I was walking your street the other day. He sure is a cutie!! Look at those gorgeous mountains in the background! Congratulations little man! You’re cruising now! by taking the pedals off the bike, they automatically keep their feet out wide. Then they can easily catch themselves when they start to tip to one side. By taking the pedals off, you focus just on learning how to balance. Once they learn to balance and you can see that they have the balance part down, then you can add the pedals back on the bike. This little bike does not have a kick stand, although that would be nice. Does that help with your question?! They learn to balance on the bike by first scooting then, as they get more confortable, pushing off with their feet and glidding for longer and longer spurts. (You could leave the pedals on but they would really get in the way.) Once they have that down, putting feet on the pedals doesn’t throw them off balance. DTMS? Wow 4 years old? Congrats to him!! We are struggling with the 7 year old’s confidence that it’s okay to try no training wheels. Thank you for sharing, I will try your tips and see if that helps! my boy is 3.5, and his sister is just over two, she has a run bike (2nd hand shop, $5), he has a bike with training wheels, but I think after reading this, I’m going to take them off…will have to see how difficult the pedals would be to take off – but I love that idea! thanks! Another thing that is needed is a willing parent. My husband refused to try to help our daughter when she was little because he felt it was beneath him to run after a bike to get her started. I couldn’t due to my Rheumatoid Arthritis – I was lucky to be walking at the time. Jac is in the Autistic Spectrum and has Dyspraxia. Dyspraxia is a coordination issue due to her nerve endings not developing correctly. This condition also affected her potty training. Jacquelyn is now sixteen and still can not ride a bike. If you can’t tell, I am a little bitter with him about this. 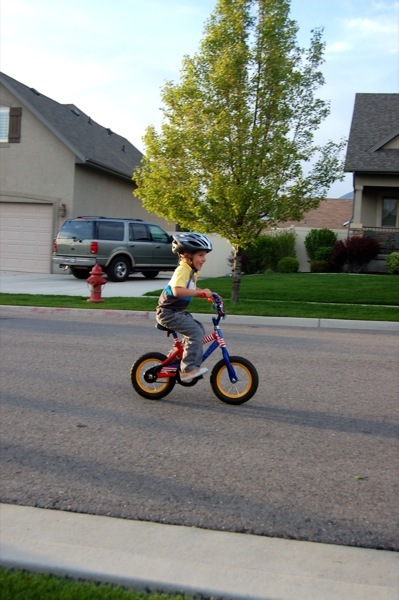 One of the greatest personal milestones for a child is the day that they can ride a bike. Jac doesn’t have this. P.S. In my bitterness I forgot to congratulate Aiden. Yeah for you!! P.S.S. You know, it just occured to me that maybe this would work with even though she isn’t little anymore. I’m going to get her bike out and try this. Thank you! – I have bought her five bikes over the years hoping that one day she would be able to ride; maybe this is the year!?!? I say yes! It doesn’t matter what age you learn. Thank you for sharing your story, I wish you all positive thoughts in this. Yea Aiden!! I can’t wait to see him ride!! Will call soon about getting together! Rats…no wonder Bird can’t do it…her bike has hearts on it, not flags. We’ll have to change it up! LOVE this post Kami! He looks so stinkin’ adorable on that bike! Kenny and I needed to read this post a few months ago! We just taught the girls. So fun to see them take off without training wheels for the first time! Love, love, love!! That is such a smart way to learn how to ride a bike:)!